Laura wants to see a world where everyone has access to food, safe water, shelter, income, education and a life that is free from violence. 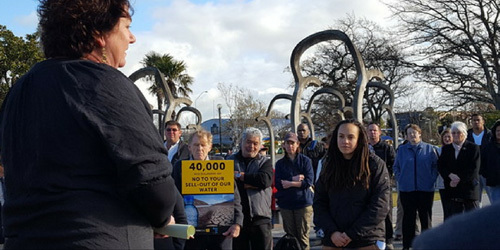 As the Director ActionStation she's helped build a community of over 150,000 members to participate in campaigns designed to drive a fairer, more just and sustainable Aotearoa New Zealand. Laura is also the Co-founder of RockEnrol - a youth-led volunteer-run organisation dedicated to building and activating political power for young people. Her work is driven by the belief in robust democracy powered by informed and connected citizens, guided by accountable leaders. She believes in putting people and planet first, and is passionate about unleashing the power of people through effective collaboration and values-based communications. Laura took part our very first Live the Dream programme for young social entrepreneurs, graduating early 2014. She focused on developing and testing ideas to mobilise the power of the crowd to create change – from feeding the masses to fundraising for causes – the 1 Million People Project. Concerned with the low voter turn out amongst young people Laura took her learning to co-found Rock Enrol. In the lead up to the election, they got Kiwi musicians on board to put on gigs, and to attend the gigs people had to be registered to vote – an idea that helped to engage thousands of young people. Soon after Live the Dream, Laura was offered her dream role as the Campaigns Director of ActionStation, and has played a critical role in helping to build it to an engaged community of more than 140,000 members. Laura regularly appears on the media, and speaks at events across New Zealand and around the world.